I love many things about travel, but one thing that stands out is change. If you don’t like a place, you can change your direction and plans immediately. If the rest of daily life were so easy. 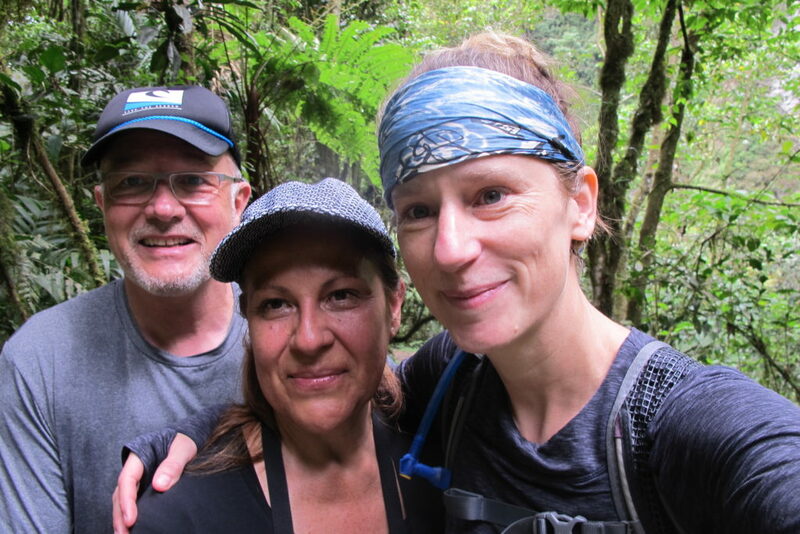 I was scheduled to return to Iquitos–the main Amazonian city–for another five days. But the thought of going back to the unrelenting heat, noise and filth made me uneasy. I cancelled my airbnb in Iquitos, and wasted a return flight back, but hell, why go somewhere you don’t want to be? I’m glad I did. As my taxi kept climbing the hairpin switchbacks to the lodge, a bit nauseous-enducing actually, I could her birds chirp. Sticking my head out of the window, the air was crisp. Oh yeah, and this is the view from my room at the Gotca Lodge. A girl’s gotta splurge once and a while. “Melanie, privacy is a North American luxury,” says my buddy Matt, who lived in Peru for a year. I was about to believe him until I found this sanctuary of quiet. No taxis bleeping, repeatedly asking: ‘taxi, taxi, taxi!’ No, I don’t want a friggin taxi. See these two things I’m standing on? They are working just fine. Sorry. Cabbies are only trying to make a living. But, it just got too aggressive. Outside the Iquitos airport, drivers started pulling at me. “Say taxi once more, I dare you.” See what happens. 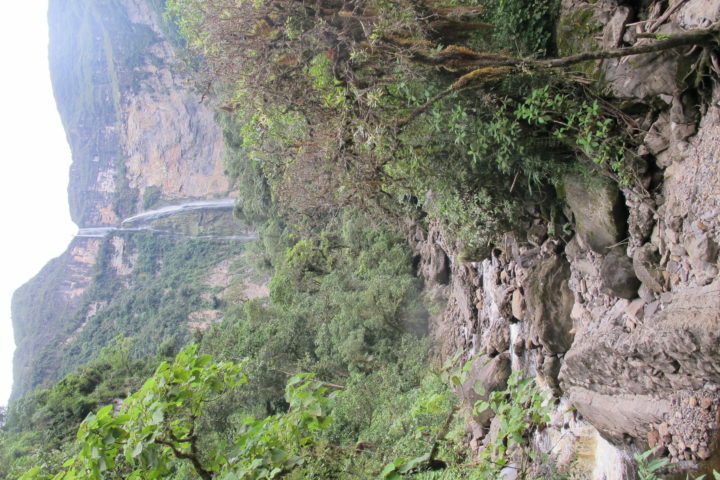 Gocta Falls is located in the town of Cocachimba in Northern Peru (So, an hour flight from Iquitos to Tarapoto, and then a seven hour Bus from Tarapoto). The town is maybe five to 10 houses, a few restaurants, a store or two, and some artisan shops around a main square that is essentially a soccer field. When I arrived kids were playing volleyball; happy place. But, the real draw: the waterfall. At 771 meters, it’s the world’s third largest waterfall. Birds chirp, water gushes, and alpacas munch on the grass; don’t get too close though. These suckers spit. 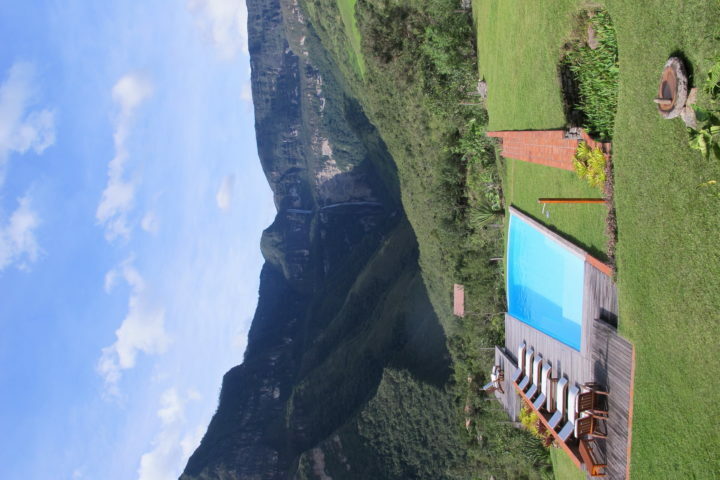 AND, nearby is the town, and entire region, of Chachapoyas. My last night in Toronto, Paul and I went to a beautiful Italian restaurant on Queen, and the couple next to us just got back from Peru: “Go to Chachapoyas! It’s so quiet –few tourists– and it’s just amazing. It’s also the sight of the Machu Picchu of the north called Kuelap. 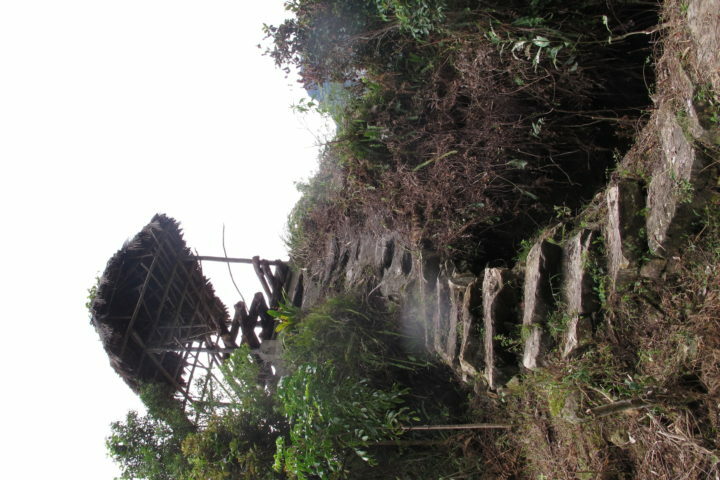 Ruins of the Chachapoyas –people of the clouds. The entire region is full of hidden ruins–some I was crawling through the woods to find! More on this later. So, while I am marking papers in my room, watching the waterfall for mental breaks, I mapped out a week’s worth of hikes here and in the Chacha region. If you’re not staying at the Lodge, or in town, it’s about 6 km uphill to get to the trailhead. Often you can find a motor taxi. Then, be sure to pay 10 soles at the tourism office and away you go. You can walk two hours to the bottom of the falls, or, the less ‘sissy’ route, scramble another two hours up to the base of the falls. Steep. You don’t get to the tippy top, but close. Nature’s stairclimber. I started walking with Marco who just had hip surgery and his wife Carmel. Lovely people. Amazing- walking up the wooden ladder, alone, the fall’s spray in my face, I felt like Indiana Josie. Female explorer. Cue the music, please. 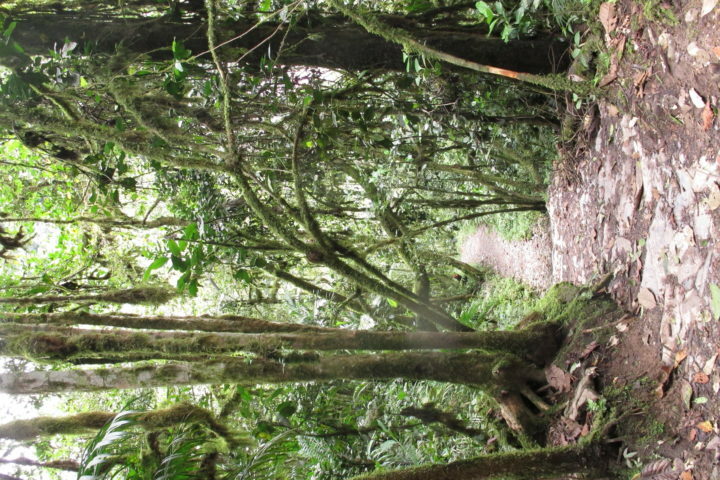 Next day, with rubbery legs, I hiked about 15 kms, but mostly flat, to THREE waterfalls. And it turns out, one of them is 900 meters! What? Cray cray (sorry, student verbiage creeps in time to time). Hired a taxi, not the cheapest route, to a town about hour away called Cuispes. The trailhead is through the wooden door, which was closed, so I ducked under while my cabbie held the barbed wire. Wow. With so much rainfall, this jungle feels like its breathing. Coming across wild orchids, strange flowers and beetles, it’s magical. 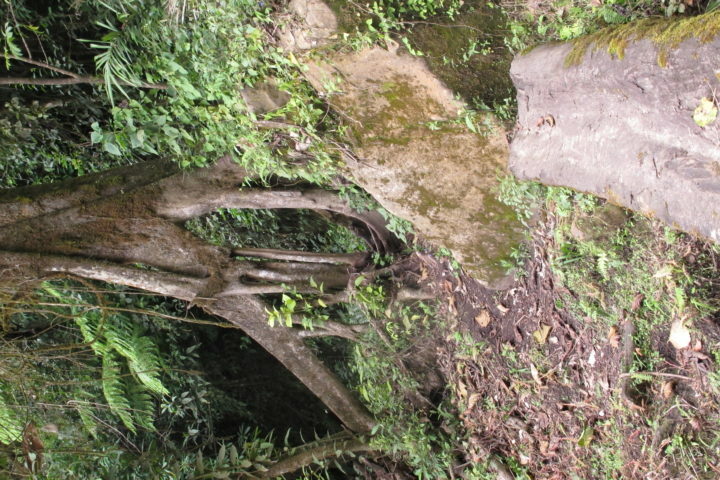 Yes, a platform into the jungle, followed by a walk across the river on a fallen tree and through the middle of the tree. Only question remains: where are the hobbits? This hike was glorious. Sitting on the bank watching Yumbilla’s water cascade into mist, if I laid back into the moss long enough, I’m sure the forest would simply grow over me and carry on. I’ll post hiking to the rest of the region soon; ruins such as Kuelap, which is an amazing fortress in the clouds. And get this, some of these Chachapoyas people, three times older than the Inkas, actually fought alongside the Spanish. So much to learn. Talk soon. Firstly, love the photo of you. There’s nothing like the glow of being happy and active (at least that’s what I tell myself when I’m photographed sweating from exertion; you look relaxed). Secondly, the taxi story reminds me of being in Marrakech where there’s a lot of attention and trying to get you into their restaurant/store/etc. I finally said to one man, who’d tried to get me into his restaurant (not a euphemism) repeatedly over a series of days by saying something along the lines of “Nice lady, nice lady, blah, blah, blah.” I finally stopped one day and said, “I am not a nice lady.” That ended that.